Adirondack Whitewater Rafting: Where To Go, Tips On Getting Started & More! Ready to have a rip-roaring time on the river? Plan a whitewater rafting trip in the Adirondacks! From spring through fall, rafting whitewater rapids is one of the most thrilling outdoor activities in the region. 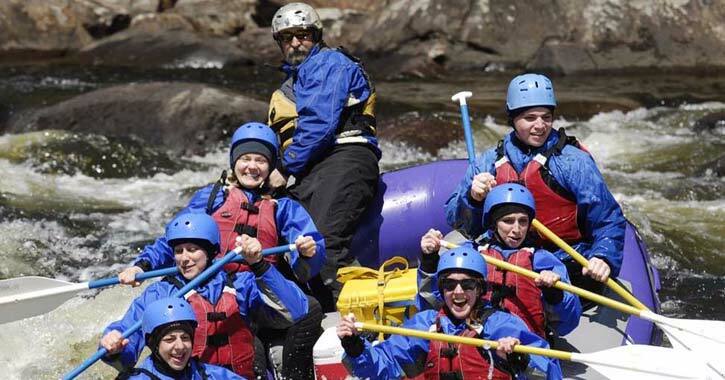 Know what to expect out on the water by reading the tips below, then choose from one of the many Adirondack whitewater rafting companies listed here to book your next adventure! The whitewater rafting season in the Adirondacks typically runs April through mid-October. Spring is the best time for thrill seekers looking for WILD rapids! The snow melt-off creates ideal fast-moving whitewater for weeks during the spring. The Hudson River rapids have Class III, IV, and V ratings. Day whitewater rafting trips almost always include all your gear, life vest, and a snack. Be in good shape. You don't need to be super fit, but being in good health is always an important part of an outdoor adventure. Much of the ride will not be whitewater. You'll have stretches of calm (or flat) waters that lead up to the fast and exciting rapids. Especially in the spring and mid- to late-fall, dress WARM in all polypropylene, fleece, and wool. Wear two pairs of wool socks and NO COTTON! Do not drink lots of coffee, tea or other diuretics before a ride. There are usually no bathrooms. Average cost is usually between $50-$100, but varies based on age, length of trip, and season. Protect your skin from excess exposure to the sun. Put on your sunscreen! If getting it wet or losing it in a river would be distressing, don't bring it. This goes for expensive cameras, jewelry, and unnecessary gear. Never been? Here are tips every first-timer should know! Tip: Many whitewater rafting companies can recommend nearby lodging and camping packages for out-of-town visitors. Or, you can view our lodging specials to find a great place to stay, whether you are planning an overnight, weekend getaway, or a longer vacation.